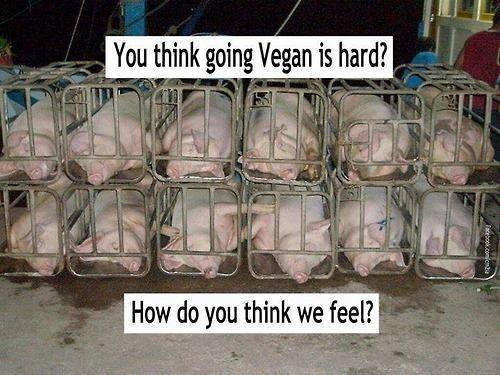 America’s animal factory farming industry is the one of the worst acts of human cruelty and violence towards animals. In the United States, around 10 billion animals are slaughtered every year. There has been criticism of slaughter methods including complaints that some of these animals are being skinned or gutted while apparently still alive and conscious … including blinking, kicking and shrieking. Also, there has been criticism of the methods of transport of the animals to the slaughterhouse in conditions that often result in crush injuries and death en route. 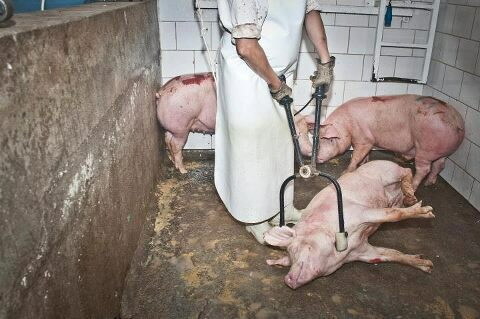 Slaughtering animals is a global tragedy on a monumental scale. Some have compared the abuse of human beings in Abu Ghraib to the manner in which Americans violently slaughter animals. If one could quantify the amount of animal pain and suffering as a result of factory farming throughout the world – It would be astronomical. Often during the transportation of animals to slaughter, the weaker animals are severely injured including open wounds, fractures, crush injuries, eye balls hanging out of their heads, eviscerations, organ prolapses, calf injuries, etc. A video documentation in 2008 exposed California slaughterhouse workers using shock prods, chains, high pressure hoses and even forklifts to move suffering, bellowing and injured downed cattle into the slaughterhouse. Sadly, Farm Sanctuary has documented similar treatment to animals throughout the country. What has been caught on video is just the tip of the iceberg of animal abuse at slaughterhouses). Downed animals awaiting slaughter often suffer for hours or days at a time without veterinary care. Changes are needed in terms of laws and oversight.